An impressive Paleolithic mammoth ivory carving from Hohlenstein-Stadel Cave has finally been restored, after countless hours of meticulous puzzle work by several dedicated conservators over an extended period of several decades. Hundreds of mammoth ivory shards have been pieced together to restore the breathtaking ancient representation of a lioness standing in an unnatural, upright posture (below). First discovered in 1939 as tiny, unrecognizable fragments excavated from within a small chamber at the end of the wide limestone cavern, the mosaic of shards were assembled in the following years. Subsequent sieving of debris piles left by the primary excavation turned up several hundred more miniscule ivory fragments in 2010 that had been overlooked, further defining the carved forms of the figure's back side. 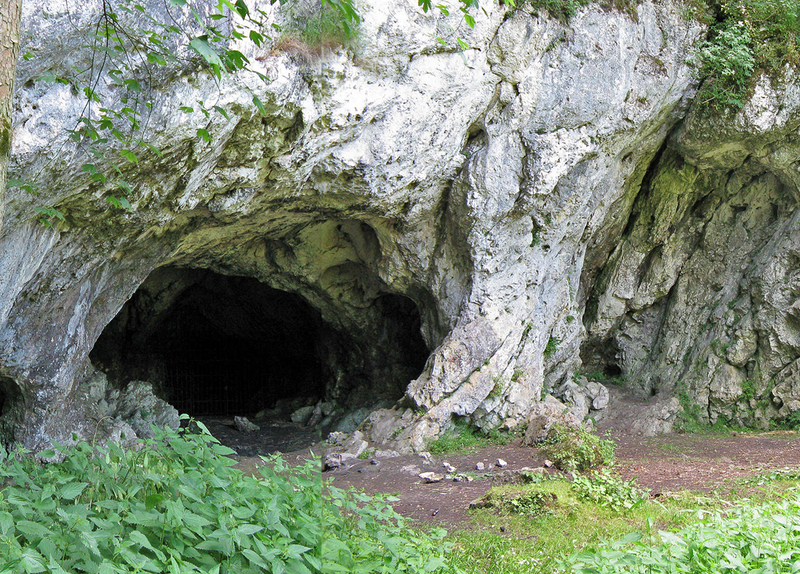 The Hohlenstein-Stadel Cave idol has been erroneously characterized by archeologists as presenting a combination of human and animal features, but this hypothesis does not stand up to close scrutiny. In fact, the votive figurine does not represent a man or a woman with the head of a lion, but a lioness --presented in an upright, human-like posture. A recent archeological report details the initial excavation at Hohlenstein-Stadel Cave and offers a brief history of the conservation of the 29 cm-tall ivory artifact (Kind et al., 2014). The relative lengths of the figure's long torso and the much shorter limbs, along with the deliberately rendered forms of the paws, confirm the animal anatomy of the figure as that of a lioness. The female gender of the votive figure has also been specified by the artist, as male lions possess a thick mane that was not included in the carved forms of the Hohlenstein-Stadel Cave sculpture (ink drawings above). The upper left arm of the lioness was incised with a series of seven parallel gouges that represent votive hieroglyphs of the Paleo-Sanskrit language that can now be translated, for the first time. These repeating lines reference the thunderous acoustic force of planetary resonance transduced by the Great Pyramid of Giza, Egypt, reading: raua raua , meaning "Roaring, roaring." The booming infrasonic output of the Great Pyramid operating at the heartbeat resonance of 1.45 Hz sounds virtually identical to a roaring lioness. This auditory interpretation of the parallel arm markings is further supported by expressed reverence for the prime number 7, which was once closely associated with the Great Pyramid and Indra (the deified planet Jupiter), actually encoding the 399-day synodic period of Jupiter as 71 + 72 + 73 = 399. Radiocarbon dating of bone fragments from the strata in which the fine ivory idol was found places its origin in the Aurignacian Period, calibrated at ~40,000bp, revealing it to be the oldest known figurative sculpture yet recovered. 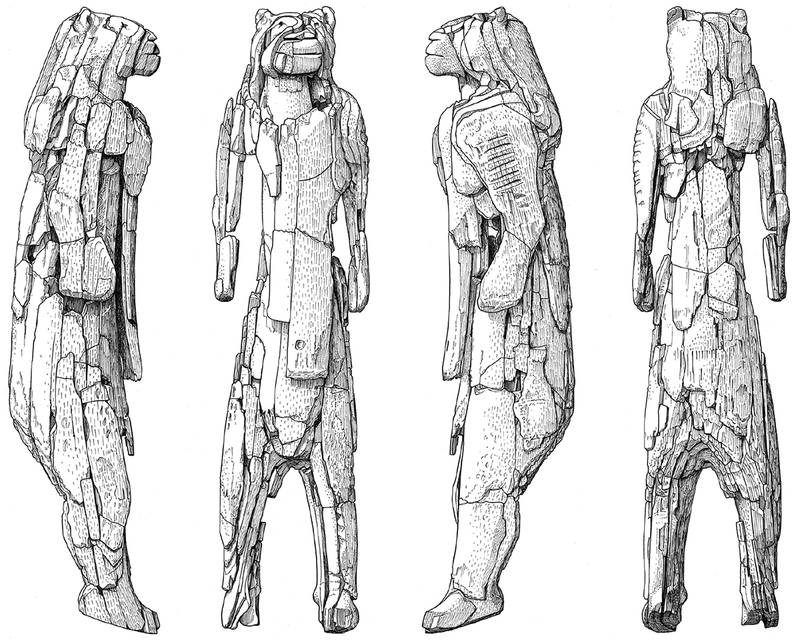 New revelations concerning the sophisticated cultural context of the Hohlenstein-Stadel Cave idol have identified the lioness figure's resemblance to ancient Persian sculptural depictions of Zurvan, closely associated in much later times with the religious perspectives and ideals of Zoroaster and Zarathushtra. The votive title 'Zurvan' is a compound name composed of two Paleo-Sanskrit words -- zur and van. 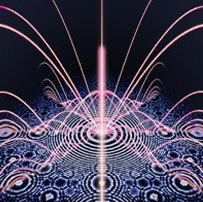 Classical Sanskrit still preserves the essential meaning of these ancient sacred syllables, together signifying "Infinity Resounding", directly referencing the cosmic force of infrasound resonance. Q: (L) In the course of my recent research, I keep going deeper and deeper and further back following one thread after another... In brief, Zoroaster claimed to have had a vision, or so the story goes, that revealed to him the One God, Ahura Mazda, and he promoted a religion of almost pure monotheism as well as being more or less the originator of the idea that human beings have the free will to choose good or evil. He also was the first to come up with ideas of messianism, eschatology. It was an apocalyptic religion in the sense of being revealed, but also that there were to be revelations about the end of time --time of course being a very important concept in his religion... Now, there are those who say that Zurvanism was an attempt to deal with some of the dangling problems that Zoroaster left in terms of his dualism. One of his hymns describes Ahura Mazda and Ahriman as twins, so, they came up with Zurvan, the ultimate god of space/time as father to the twins to explain this. Is that in fact the case? A: No. Zurvan was the ancient god of the steppes and the Indo-Aryan peoples. Q: (L) Okay, I've got a paper here... It seems that Zurvan was perceived as the god of infinite time and space, and was described as, "One Alone, a transcendental neutral god, and without passion. One for whom there was no distinction between good and evil." So, Zurvan had a varied history... So, the problem I want to get to right now is the idea that Zurvan was represented as the lion-headed god. 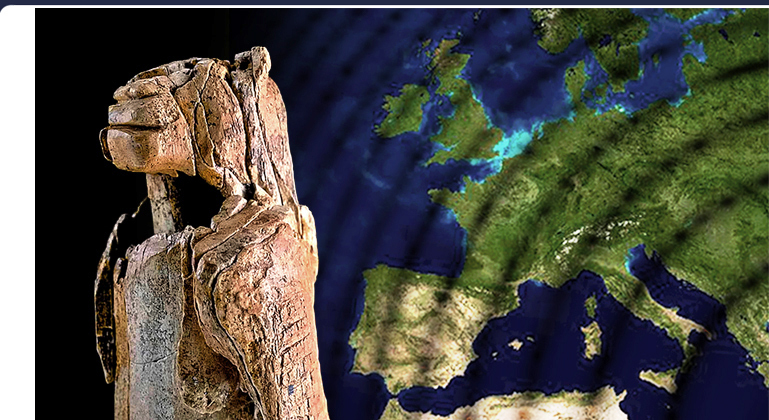 There was a lion man figure found in Hohlenstein-Stadel, which is a German cave. It's carved out of ivory, and it's the oldest known zoomorphic animal sculpture in the world, and the oldest known uncontested example of figurative art. It has been determined to be about --ready? 40,000 years old!! That was by carbon dating the material which was in the same layer where the figure was found. It was associated with the Aurignacian culture and it was 29cm in height, carved out of mammoth ivory using a flint stone knife. Seven parallel, transverse, carved gouges are on the left arm. The figure of Zurvan is often represented with a serpent coiled around him seven times. It is said that the sculpture shares certain similarities with French cave wall paintings which also show hybrid creatures. 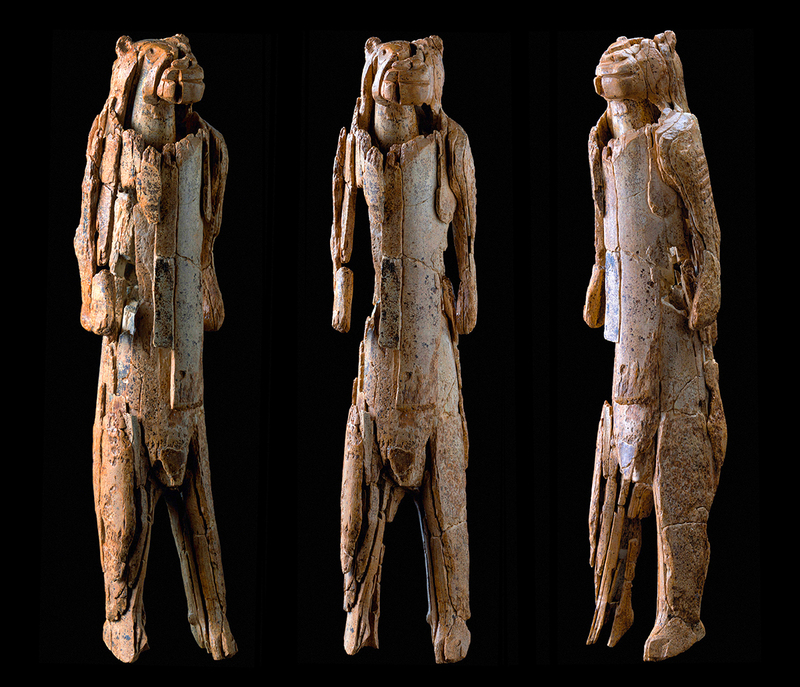 The Lion man is several thousand years older. Anyhow, this artifact seems to resemble very closely the lion man figure that was described as being the representation of Zurvan. So, I guess my question is: Are we talking about the same religion or religious ideas or perceptions that were common to the cultures that produced the cave art in Western Europe? Q: (L) And they came up with these ideas of infinite time and space that far back? A: And so much more. They were "connected". Q: (L) So in other words, what we are looking at here through a probably distorted survival via Zoroaster or Zarathushtra is that the Aryan religion was based first of all on a supreme principle of infinite time and infinite space from which was born essentially "good mind" and "evil mind" as Zoroaster put it? Q: (L) And this same religion, either in its older form or its later elaboration by Zarathushtra, was the origin of the ideas of free will? Q: (L) Basically, it almost seemed as though it was a religion about information. Everything emerges from information, but there are some other very particular things about it that are very advanced. They were talking about things that physicists talk about nowadays. Confirmation of Knight-Jadzcyk's intuitive hypothesis concerning the Zurvan religious origin of the Hohlenstein-Stadel Cave idol was given by the Cassiopaeans with important comments in quotation marks, hinting at highly advanced technological aspects of the cave setting itself that have not been realized by any of the scientists involved in the research of Paleolithic cave sites throughout the world. "Connected" refers to the psychoacoustic synchronization of all brainwaves and biorhythms at every geopolymer-reinforced cave, temple and pyramid site worldwide. Hohlenstein-Stadel Cave is a karst cave that was entirely refaçaded in geopolymer limestone (below), composed of reconstituted calcite that tranduces infrasound into electrical fields in the same way as the calcite crystals of the pineal gland. Hohlenstein-Stadel Cave, Germany (48.549325°N, 10.172431°E) is located 1,693 miles from the Great Pyramid of Giza, Egypt, corresponding to 6.80% of Earth's mean circumference distance. 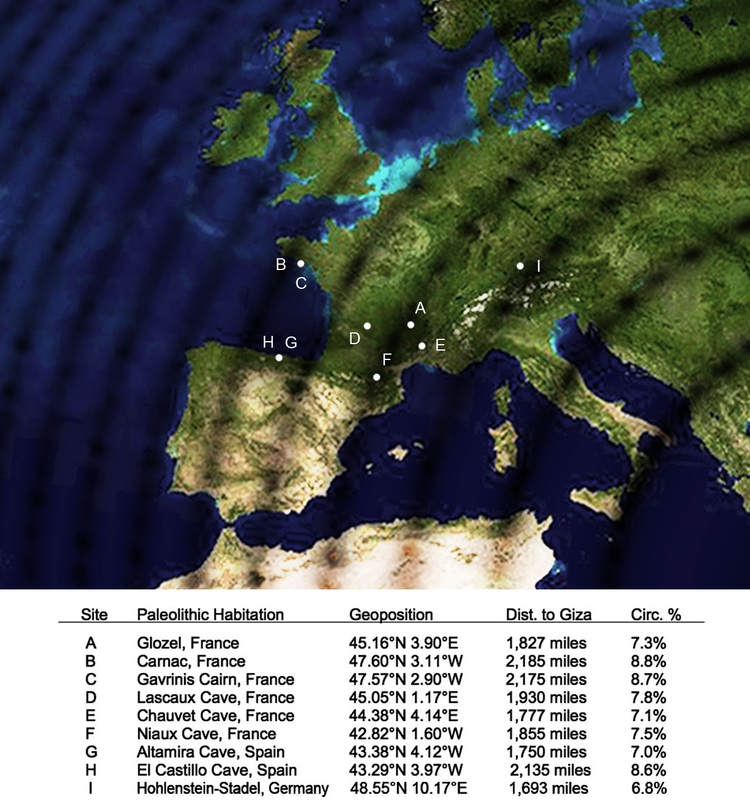 A three-dimensional global map of planetary infrasound standing wave resonance provides geopositions for several ancient caves and megalithic sites linked with Atlantean psychoacoustic culture, including Glozel, Carnac, Gavrinis, Lascaux, Chauvet, Niaux, Altamira, El Castillo and Hohlenstein-Stadel (below). At each of these sites, Paleo-Sanskrit votive language expresses the special bioelectrical influence of Jupiter, hailed as "the One, the One, the One...", signified by a square and a line of dots --as airbrushed onto the ceiling murals of Lascaux Cave, France. Votive phrases of the Zurvan tradition closely echo high scientific and spiritual knowledge possessed by the Sons of the Law of One, a distinct tradition applying the psychoacoustic temple practices and geopolymer chemistry knowledge of the Atlantean civilization. Advanced psychoacoustic functions the Great Pyramid have only recently been identified, along with Paleo-Sanskrit inscriptions above the main entrance that suggest the great antiquity of the Orion Pyramids of the Giza plateau far exceeds the Aurignacian Period, during which the Hohlenstein-Stadel Cave lioness figure was carved. The cave itself was refaçaded for efficient reception of infrasound waves. Revolutionary scientific information has emerged that compels not only a revision of known history, but forms the basis for reconnecting ourselves with the great knowledge of our sophisticated Paleo-Sanskrit ancestors, for whom space and time were overcome by the spaceless and timeless dimension of spirit. Like the Hohlenstein-Stadel Cave lioness idol, the roaring lionesses of Chauvet Cave, France can now be understood in their proper religious context as representations of Zurvan: Infinity Resounding.